I made it back over to Artisan Wine Lounge and CafÃ© last Saturday with a big group of friends in tow. We were attending the latest event that Lena Chu had lined up at her superb destination venue in downtown Walnut Creek, CA. 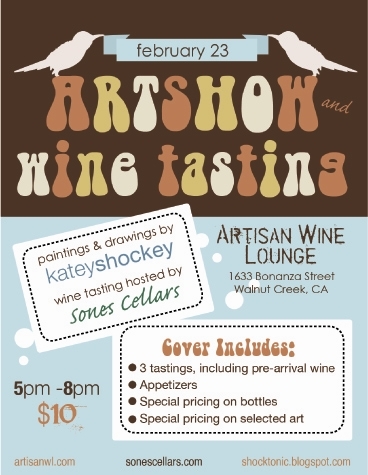 The event was a showcase of two artists, Katey Shockey, the artist currently showing at the lounge and Sones Cellars, a family boutique winery from Santa Cruz. Katey has had her work featured in the lounge since Beth and I first visited the relatively new wine spot, which I wrote about here. Since that first visit, Beth, myself and our friends have grown quite attached to the lounge and have been regularly visiting the wine joint. It’s conveniently located near BART, as well as one of the stops on the CC Free Ride bus that runs it way through the downtown shopping districts, starting at Walnut Creek BART. 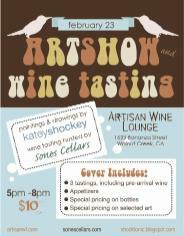 Last Saturday figured to be a great way to spend an evening trying wine and discovering new art…and indeed it was. For $10 you were allotted tastings of the three wines that Sones Cellars was pouring that night, including a currently unreleased white blend (although when pressed, you were allowed a few more!) and some wonderful hors d’oeuvres created by Lena and her resident chef, Jenny. 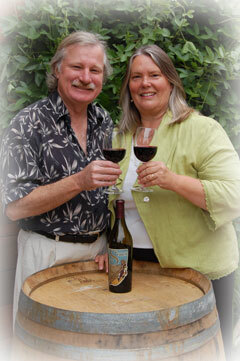 Sones was represented by the couple that owns and runs the winery, Michael and Lois Sones. Michael and Lois specialize in two grapes that are rather grand at producing great wines in California, Petite Sirah and Zinfandel. Lena has carried the 2004 Sones Pet ever since I first swung by the place and has been harping on me to try the wine, so I was excited to actually have the chance to not only taste a variety that is a personal favorite, but also to meet and speak with the winemakers! While I didn’t get much of a chance to speak with Michael or Lois (the event was incredibly well-attended), I did find out that their Pet is a phenomenal intepretation of the varietal, filled with gaminess, deep depths of black and blue fruit and big but round tannins. It was a hit with the natives, along with their quixotic white blend known as La Sirena. The ’07 we tasted has yet to be bottled, but the wine is a tremendous effort that mysteriously acts like two equally complex whites depending on its temperature. Early in the evening I tasted it cold, a few degrees cooler than cellar temperature. I immediately noticed the aromas and flavors of crisp citrus and grass, coming from the Sauv Blanc in the blend. Later in the night, however, the wine had warmed to a few degrees above room temperature and it was completely different, now dominated by the Viognier and Pinot Gris, exhibiting strong aromas of white fruit and flowers followed by a bigger mouthfeel and more of that tropical white fruit on the palate. Fascinating! Lena later informed us that the wine is 43% Viognier, 43% Pinot Gris and only 14% Sauvignon Blanc. At any temperature however, the wine is glorious blend of the three white varieties and is a can’t miss in my book. I ended up buying a bottle of all three wines that Sones brought that night. Please see my tasting notes on the Sones’ wines below and if you’d like to list them all in your own WineLog or Wish List, they are tagged with “ArtisanWL” and “ArtisanSonesShockey.” Enjoy!